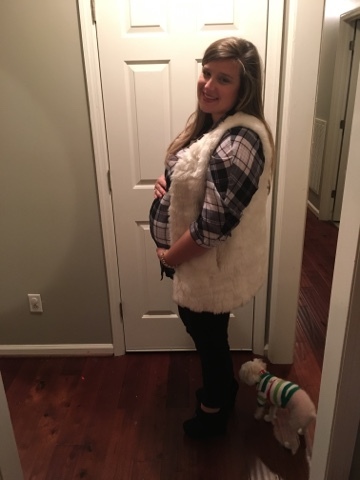 Maternity Clothes: All bottoms are maternity. I've got several tunics and tops that I'm getting away with. Sleep: I've slept great this week. What I miss: Having enough energy to make it through the day. I'm starting to feel very pregnant. Cravings: None really. Ready for Thanksgiving! Symptoms: Feeling large. I've been saying I don't feel as big this time around but I'm starting to doubt that. I can't do too much without needing to rest. I usually decorate the whole house for Christmas in one day, I started last night and it's going to take me a few days to get it all up. Best Moment this week: Finally started cleaning out the nursery. I also went through all of Barrett's clothes and pulled out the few things that will work for AveryAnn. Hopefully we can really get moving in there now. We're only two weeks away from the third trimester and I'm feeling the time crunch. I thought my pregnancy with Barrett went by fast but this time is going so much faster. I feel like November was a blur. I go back and forth between "can't wait until she's here" and "I need time to slow down so I can get some things done."